Gold and silver declined for a second day Friday, deepening weekly losses that have extended to six consecutive weeks. For gold, the losing streak is the longest in eight years. On Friday, gold for February delivery dropped $25.70, or 1.5%, to close at $1,648.90 an ounce on the Comex in New York. Prices dipped 0.4% on the week and are off $102.50, or 5.9%, since last rising in the week ending Nov. 23. Despite the string of weekly losses, gold prices in 2012 advanced 7.0% for a 12th straight annual gain. Earlier Friday gold was down as much as $48.60 after falling $14.20 in the previous session. FOMC meeting notes released Thursday revealed most members saw QE ending in 2013, which proved bearish for precious metals. "The market is being held hostage by the Fed’s statement," David Lee, a vice president at Heraeus Precious Metals Management in New York, said in a telephone interview relayed on Bloomberg. "This is a knee-jerk reaction … The unemployment number tells us that the health of the economy has not improved significantly," Lee said. The yellow metal pared some losses in reaction to a mixed U.S. jobs report. The Labor Department said that the U.S. economy added 155,000 jobs in December but the unemployment rate stayed at 7.8%. The rate for November was initially reported at 7.7% but it was revised upward. "Investors think that the payroll report is still not enough to change the Fed’s accommodative policy, which is a positive for gold," Reuters quoted Howard Wen, metals analyst at HSBC. Weekly gold surveys continue to show more participants bullish than bearish. "In the Kitco News Gold Survey, out of 33 participants, 20 responded this week. Of those 20 participants, 12 see prices up, while seven see prices down, and one is sees prices moving sideways," Kitco News reported. "Even though participants who see higher prices cite accommodative central bank monetary policy globally, many of those who see weaker prices said gold is going to still reel from the surprising news out of the December Federal Open Market Committee meeting minutes which showed that policy-makers could end monthly purchases of U.S. debt by the end of this year. Several suggested this will weigh on gold for some time…"
Bloomberg’s weekly gold survey results read 20 bullish, 5 bearish and 2 neutral. 2012 ended on Monday with annual gains of 8.3% for silver, 9.8% for platinum and 7.2% for palladium. For the week, precious metals with losses were gold at 0.6%, silver at 2.8% and palladium at 2.1%. Platinum advanced 2.0%. Aside from New Year’s Day when businesses were closed, sales of American Eagle gold coins advanced every day of the week. U.S. Mint distributors quickly grabbed newly dated 2013 issues released Wednesday. The bureau sold a total of 72,000 ounces this week across its four Gold Eagle sizes. 65,500 ounces of those go down for January, which is already higher than sales levels from eight different months in 2012. New 2013-dated American Buffalo gold coins also attracted buyers as sales for January are at 14,500 ounces, surpassing sales in all but two months in 2012. 2012-dated American Eagle silver coins sold out on Dec. 17. The U.S. Mint will begin selling this year’s dated silver coins on Jan. 7. 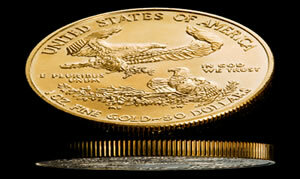 For a look back at bullion coin performances, read about 2012 American Eagle coin sales. More recently, U.S. Mint bullion sales follow for the last few days, the week and for 2013. Coin sales figures shown above are in the number of coins sold. Calculate total ounces by using the bullion coin’s weight. U.S. Mint distributors have not ordered any America the Beautiful Five Ounce Silver Bullion Coins since Dec. 4.